Last week was brutal. One of the longest weeks of solo-parenting to date. By the time I got to Friday, I was crawling toward the finish line when Corey would get home, sweat soaking my hair and dirt under my fingernails. The thing that saved my life each day: a two-hour nap with Kieran, while Teyla played on my iPad in the next room. (Thank you God, thank you God, thank you God.) And even still, I operated in zombie mode most of the time. My brain was fogged, and my world kept spinning and I couldn't focus to save my life. I wandered around my own house in a daze, I carried around the same set of doll clothes for 10 minutes because a. I forgot I was holding them and b. I couldn't really remember why I had picked them up. I let the kids play Wii and watch TV way longer than I should have, simply because I didn't know what else to do with them. I was a mess. Which might explain why it took me until Friday to realize: I hadn't had a cup of coffee all week. It was unintentional. I was queasy, from the vertigo, and coffee always smells horrible to me when I'm nauseous. So I mostly drank tea and ate bland things like toast and yogurt and the occasional McChicken - you know, the normal things one eats when sick. And I didn't have headaches or anything, so I figured I was doing good without my usual mainstay. 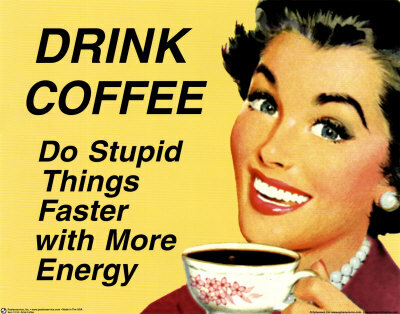 But Friday morning, a thought pierced the haze: I wonder if my brain isn't working because of lack of caffeine? I swung by Caribou to test my theory, and lo and behold: I was a different woman by afternoon. I was still dizzy and in vacation recovery. But the stupor was gone. I could think again. I didn't fall asleep reading my kids a book. I went to bed after 10:00 PM. Turns out, coffee is a bit of a pick-me-up. Who knew? Moral of the story: Sometimes you need a cup of coffee to realize you need a cup of coffee. I love your voice. I can hear you telling this story, and it makes me smile. And WOW - I really cannot imagine going that long without coffee. You must have needed it BAD.